Hailing from a musically endowed family, I was initiated into music by my parents Sri.N.Kameswaran and Smt. Renganayaki Kameswaran at the age of 7. Presently, I am a Vainika and Vocalist. Also a Guru and a student of Music for Life. 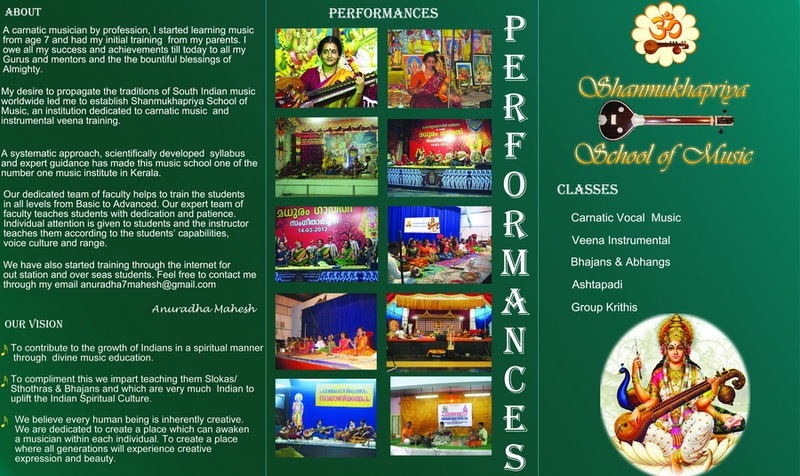 Established Shanmukhapriya School of Music, an institution dedicated to carnatic music and instrumental veena training with the aim of providing a platform for musically inclined minds to nurture their talents . There are a handful of dedicated students learning Vocal Music, Veena Instrumental, and other Sanskrit Slokas that are very much Indian. Conducting Online Music Classes for many interested enthusiastic students . Apart from concert tours, also conducting workshops and teaching assignments on Carnatic Music . Have released an album for Stress Relief in Raga Bowli which is very well received by music enthusiasts. With a career extending over two decades, I am more interested in the subject Music Therapy. I strongly believe that a combination of Manthras and the curative power of ragas can bring a Himalayan change in human beings as far as the health aspect is concerned. My activities are centered around learning music, teaching music, listening music and practicing music. I am also deeply interested in Spiritually Oriented reading materials. I Dedicate all the Blessings in my Life to my Parents, Gurus’ and GOD. I strongly believe that a positive attitude with consistent hard work and God’s Blessings will give you all the best in your life – be it in your career or family . Planning to give back whatever I have learned and earned through music to the posterity and upcoming talents and plans to give it back in my own special way. I take great efforts to adhere to the strict classical values imbibed from my gurus. Composed Bhagavad Gita and sung with Veena background score for Music Therapy session during Ayurvedic Treatments. Has composed for the Classical counterpart of the Classical/Cinematic Instrumental Musical Fusion Programmes. Has performed concerts in various festivals organised by temples and institutions in Kerala. Presented a Paper on Kamakshi Navavaranams at the International Seminar conducted by Veda Samskruthi Nilayam during November 2017 at Hyderabad. Last, but not the least, I would suggest the upcoming talents to concentrate more on listening good music, as 80% of knowledge is acquired through listening. Practice of music should be a ritual and any student who practices 6-8 hours a day continuously for 5 years will not find it difficult to climb the ladder of success. Also I would like to tell the students that EARNING is very much a part of LEARNING , which will bestow both Saraswathi Kataksham and Lakshmi Kataksham. Workshops are undertaken on the following themes. i am in service and have started learning music keyboard for the last one year(i am 43). i live in karaikal in the east coast. i am very happy to see that you are teaching ashtapadi bhajan etc.,. i have heard the ashtapadi songs from childhood during radha kalyanams and nowadays in audio system. please help me with the notations for playing the bhajan songs in keyboard. to begin with please give me the notations for the thodaka mangalam. I am sorry to say that I know only vocals and i have not triedAhtapadi in instrument due to lack of time . So I do not have notations too. Nice Blog on Carnatic music. My son is learning carnatic music from last two years. Good to know lot details on carnatic music from your blog. Enjoyed going through your blog…Can i share the link of your blog in Carnatic Music forum in facebook…This blog will reach many rasikas and will be good benefit to them.. Welcome to my blog. Definitely you can share the link..
Mediafire is blocking most of the downloads. Files have to be reuploaded. This will take some more time. Awesome compilation, looking forward to see more. I will show these to my daughters for their upgraded music learning and for a well-rounded and grounded mindset. Thanks for the visit and the heart felt compliments…Please keep visiting.. I am Vivek .. working as an engineer in Saudi Arabia…I didn’t learn music but fond of it like anythng..infact addicted to it. I happened see your blog today and after going through it’s contents I thought of leaving reply now itself. I have been searching for such stuffs for a long time and Im much interested because of the addition of music therapy in it. Life and job here is full of stress and i want to come out of it with the power of music. As the legend Late Dakshinamurthy swamy says Music is god itself. No difference. Listening such divine music is equal to praying to god I believe. I will be regular view of this blog anyways and thanking you for such an endeavor. God Bless mam…. I am primarily a housewife and mother of two kids with a busy schedule of classes in between for the local students here. I cannot promise for sure that I will find time for you too. Let us wait till next March when the summer vacation begins. If by any chance you visit Kerala, you are welcome to my place. I am a housewife too , I have learnt music upto few varnam sand few keethanams , now I would like to pursue this further as my kids are also naturally talented and I would like to encourage them and be a role model for them . Please let me know if you can teach on Skype or FaceTime whichever is convenient for you, I live in the east coast US. Good looking website and good articles. Thank you for sharing your knowledge on the web. I discovered your blogs quiet recently and i am hooked to them! There is so much info for rasikas and learners. I have learnt both vocal and veena upto a level and would like to continue pursuing music. But i have now moved to San Francisco after my marriage and could not carry my Veena along from Bangalore, my home town since the airlines said they would charge $600 to let us check in the packed Veena box. I have been trying to find ways to transport it from India, but they all seem very expensive. If you happen to know how to transport it from India, would you please let me know. I would also like some info about good teachers in San Francisco Bay Area who teach Veena and Vocal. Any help would be appreciated. Firstly, I do not know any people in San Fransisco who teaches music as I live in Kerala/India. Secondly, I have not carried one to US and hence do not know the cost of transporting etc. I know it is very expensive to transport Veena to US. I think you have no other option, but to book through airlines, if you are very particular in resuming Veena lessons. Madam, sorry to interrupt in your conversation. But I carried my veena from Madras Airport to Washington DC Dulles airport, in Ethihad airways as a check in luggage, at no extra cost.My email ID is marugallalitha@gmail.com. If you want more info, I will help you. Thank You Lalitha Kannan for the update..Shall contact you once the need arises.. I have a child 21 years old with developmental delay and she loves Carnatic classical music. I was wondering have you done music therapy for kids with this condition? She listen to music every day. Do you have any suggestions? where is your school located? Please note that I am not a music therapist. But I am closely watching the effects of ragas. I would suggest you to teach your child with instrumental music where both hands are employed. If she can sing start training her with classical music. Let her hear a lot of music too. I live in Kerala, precisely in ernakulam district. Thank you very much. She can not speak. But she listens to music every day. Do you teach on skype? I am not taking more students as I am currently busy with some projects. Your blog is really good. Do you take lessons over Skype? Thank you. I want to learn Navavarna kritis. Will you be able to guide me? can you please tell me the songs to be sung during sadhabishekam function. No specific song comes to my mind. But generally many families do render songs praising their respective kuladaivam. Another favourite song sung during this occasion is Sri Vaidyanatham -Ataana raga- Adi tala by Muthuswami Dikshithar. The lyrics for the song is posted. Thank you very much for the kind reply. hello madam, my name is Sangeeta and iam 25years old, married and a new mom. iam basically a trained classical dancer but i also sing (not trained yet). my father is a carnatic vocalist so i know bit of music i guess. i would love to learn carnatic music from u online. please let me know the details of it. I am preocuupied till Oct 15th. Remind me after that. I am bhavaniprasad from pune. wants to know which raga /music is good for pregnant women which helps for good growth of baby. from where we can get/buy music composed on veena. The raga that comes to my mind is Yamunakalyani. I have written a review about this raga in the carnatic raga appreciation page. Pls do read. Search for this raga in the net. You may get lot of links from where you could buy this. I am looking for Guru. M.D.Ramanathan’s 1980 concert at Coimbatore that has Rama Nee Samanamevaru elaborated at length. Any chance you or known persons may have it to share. It is for private collection. I would also buy if it is available from any commercial release. I am sorry. Cannot find this song in my collection. Kindly search sangeethapriya.org. Madam I am trying to register to download some of your lessons I am not able to do register, kindly help me. I really like the way your teaching of varnams and explanations of ragas. excellent blog….sister not different from brother…I am mentioning about Mr.Narayanan who is my teacher in music when i was in Tulsa. Both sister are brother are great. Thank you very much Nagaraj for visiting my blog. Me and my sister interested in learning carnatic music and already we got 3yrs exp. How to contact you madam? Maand is a desya raga derived from 29th mela Sankarabharanam and has its origin from Rajasthani folk music.. Maand uses an all major scale notes in its descent that gives its peculiar colour. Even Yamunakalyani is very popular in Hidnustani but derived from 65th Mela Mechakalyani. Both these ragas can be seen widely used in singing bhajans, folk tunes etc. Technically speaking, Maand doesn’t have Prathimadhyamam whereas Yamunakalyani though derived from Kalyani has both Madhyamams. Yamunakalyani uses shuddha madhyam sparingly, as an occasional contrast to be given among the otherwise tivra-madhyam dominant phrases. But again we can see that there is another version of Maand which is called as Misra Maand which uses anya swaras like Kaisiki Nishadam or Prathimadhyam. Both these ragas are natural flowing light melodies. But if we closely listen, we can distinguish between these two ragas. S, M and P are strong notes in Maand. They are played or sung with full force. Nishadam is sung lightly in this raga in avarohanam. Excellent blog for all music aspirants. Its highly appreciatable that you’ve detailed each n every aspect about music in simple n more clearer. The upcoming music enthusiastics will get a close reference and inspiration like a handy book through this great blog. As an ardent fan of classical music, i really enjoying this blog articles and once again applausing your immense effort for us mam. Wishing all success in your music voyage. You will always be blessed by Sree Vaikuntanadhan and Devi Ma. want to learn hormoniam , i am residing at chennai, any online classes you are conduct ? I do not take harmonium classes. This blog is a result of Marvelous effort. Congrats on that madam. Do you handle classes at Chennai Madam? Can u give me the contact details and fee structure for classes ? Please accept my heartiest congratulations and appreciation for making available, wonderful resources, at this site! Interested In learning veena through online.I am learning veena for the past 3 years. Would like to continue further. mam im residing at coimbatore…im studing in cit..i have learnt carnatic music till gheetham….im very keen and i really want to continue this…pls help me with this mam.. I am looking for a experienced Carnatic teacher for my daughter who is good in singing and need guidance to progress to next level. 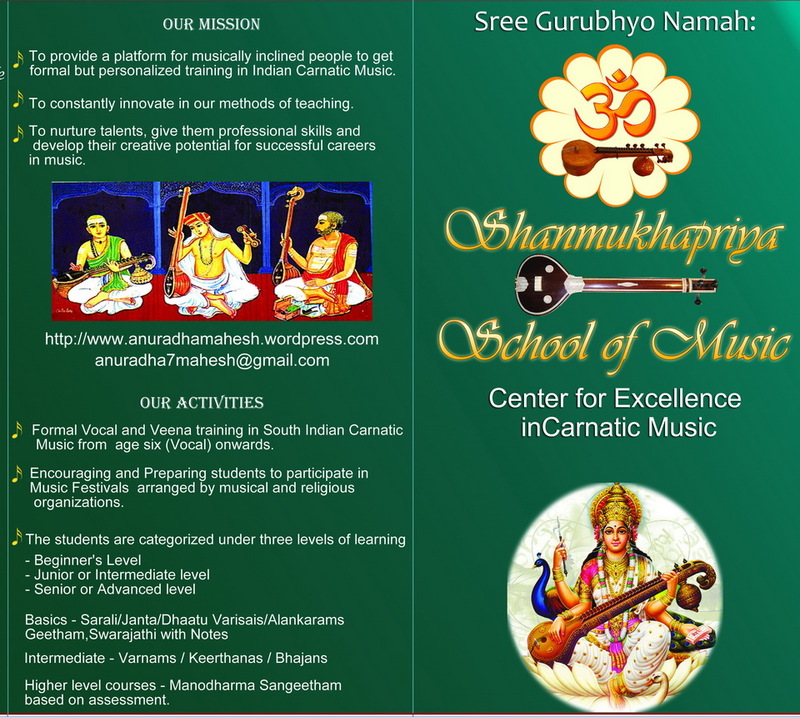 Please let me know some best Carnatic teachers you can recommend in Coimbatore. Thanks. Please visit GURU page on the menu. Dear Anuradha Mam .. I am interested in teaching my son and daughter classical music. Can I know if you teach at home ? or only at the music centre.? I m slightly held up with some projects and shuttling between Chennai and Kerala. Will be comparatively free around September/ Navarathri . I am an Ayurvedic student in Australia investigating the treatment of Autism. Can you shed light on any study or information using the Raga as therapy & you would be kind enough to share. Your website and blogs are very informative and useful. Thanks. I am looking for notation for Sri Annamacharya’s composition Vande Vasudevam in Sri Ragam, Khanda Chapu Talam. Can you help me find this or if you have, can you share? Thank you very much for visiting my blog. I do not have notation for the song. Ma’am, i will be very grateful if you can tell how to increase Brigas in voice.